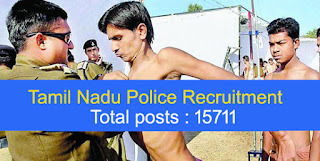 Fireman Police constable, Jail warder posts are vacant in Tamil Nadu police. Candidates who want to join TNUSRB, must fill online application from 23-01-2017 to 22-02-2017. Education requirement, Age limit and other requirements for Tamil Nadu APolice Recruitment 2017 is given below. Age limit : Candidates who are aged between 18 years to 24 years are elligibile for this Recruitment. The age relaxation is based on goverment rules. Education :- Candidates should have 10th pass Fireman Diploma, or 12th pass or its equivalent examination from recognized board or university. Selection procedure : The Recruitment of all the posts are based on written Examination, Physical test and medical test.